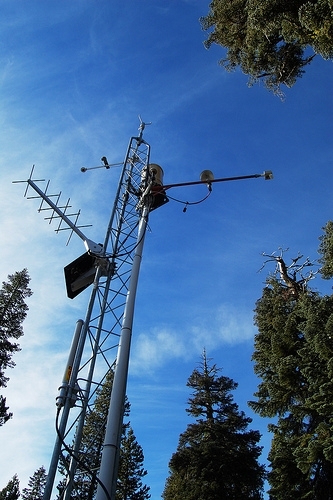 A new wireless data collection system deployed at Duncan Peak, located near the town of Foresthill on the Middle Fork of the American River basin, is part of a new water information system for California. This extensively distributed sensor network will allow for better characterization on the amount of water stored in the snow and the soil throughout the watershed. This wireless system is part of the research being conducted by University of California researchers as part of the Sierra Nevada Adaptive Management Project (SNAMP) to investigate the impacts of fuels treatment projects on water quality and quantity and how water is routed through catchments. Information collected from these wireless systems includes measurements of snow depth, temperature, relative humidity, soil moisture, and solar radiation. The data will also be integrated into models which will extend the results to areas where no measurements are being made. UC Professor Roger Bales and a meteorological station data collector. Using one base station to log all the measurements and broadcast out over the landscape, it connects wirelessly to sensors up to 350 feet away, a distance that can be extended multiple times by placing “hoppers,” or signal relays, between the sensors and base station. This ‘mesh network’ insures multiple readings so no data is lost during transmission. Twenty more base stations are planned for instillation in the American River Basin. The wireless system is made possible by the development of ultra-low power radios that can run on two AA batteries for up to two years and which can transmit data over long distances using the same technology as a home internet wireless network. This mesh radio network comes from DUST Networks. 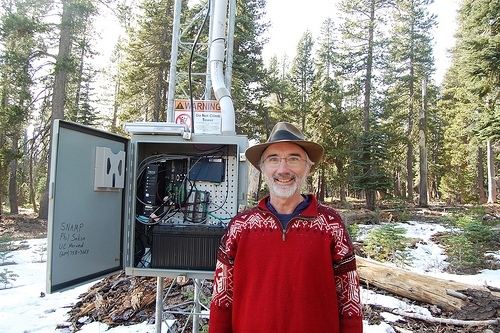 Researchers Steve Glaser and Branko Kerkez from UC Berkeley, working with Prof. Roger Bales at UC Merced, have also installed a sensor network at their Critical Zone Observatory research site near Shaver Lake to monitor the same hydrologic variables as in the SNAMP sites. If the wireless system drops out due to extreme conditions, such as a snow storm or other malfunction, no problem! Each sensor also logs to a USB stick, from which the data can also be easily retrieved. 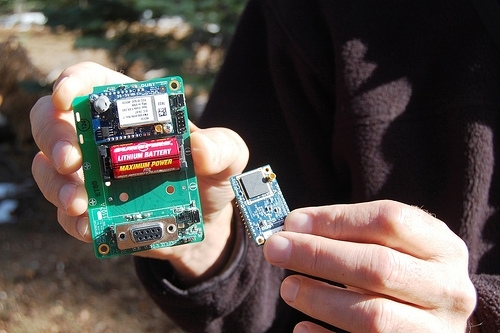 Low power computer components used in the snow depth wireless sensor network. More precise estimates on water storage within a basin will lead to increasingly accurate predictions of water availability for use in hydropower, irrigation, habitat and household consumption.